Working for yourself is an incredible thing. You have freedom, you have flexibility, you can work from your favorite coffee shop or your pajamas or another country completely. Over the last three years I’ve worked from 20+ states in the US and 12 different countries. We’ve moved twice and I take most Friday afternoons off. The challenges of working for yourself are erratic pay, depending on new clients coming in the door that you can close into paying clients who hopefully pay on time, and often increased stress that drives many back to full time employment even if you were much happier working for yourself. Another thing I can tell you is that many freelancers struggle needlessly. If you are a master at your craft and your craft is well compensated when you work for a company, then you should be able to overcome a lot of the challenges of being a freelancer/solo consultant that are related to finances. If you don’t have both of those, then this article is not for you. Pricing is one of the most difficult parts of running a business, whether a services business or a product business. Positioning, packaging, retention, they’re all challenges. This article is for the independent freelancers/consultants who are afraid to charge more. This article covers how to raise your prices. It’s not overnight and it’s not guaranteed, but you follow these guidelines then you will be able to dramatically improve your cashflow and your ability to command higher prices. In order to charge industry-leading prices you must deliver industry-leading value. If you don’t want to charge industry-leading prices then you can stop here, but if you do then keep reading. When a client comes to your site, they should be impressed with all of the places you’ve been mentioned, clients you’ve landed, and testimonials given that they can’t help but be intrigued and to trust you. This doesn’t come from being the “Facebook hacks” or “funnels” guru who last year was a LinkedIn expert and the years before was an AdWords badass. This comes from years of experience, working on a variety of brands and projects, and honing those skills through battle-tested experience. It doesn’t come from taking an SEO course or being in some funnel hacker’s mastermind group. Your site, LinkedIn profile, and network should reflect it. You must be so good at what you do that others recommend you when that topic is brought up, even if you are not necessarily the right fit for that specific person’s needs. And if that person comes to your website, then they should see how you can solve their problem, and that you are the only person who maybe can. And if you’re not? Then they self-select our because they’re not the right fit. I get told all the time that “if you eliminate the budget question then you’ll get more leads!” But the truth is, we can’t help everyone. When we remove that field or add a lower budget option, we get a lot of noise and no more revenue. Only position yourself for those that you can help, but build your brand so that you get referrals that might not be a great fit. The best way to be able to charge more is to focus on who you are able to provide immense value to. Then you are able to provide an incredible service to the ones you do sign, and not spend your time on those that you are not actually trying to sign. By always looking to provide value. You’re reading this on my personal site. Over the last almost 8 years I’ve written about 240 blog posts. 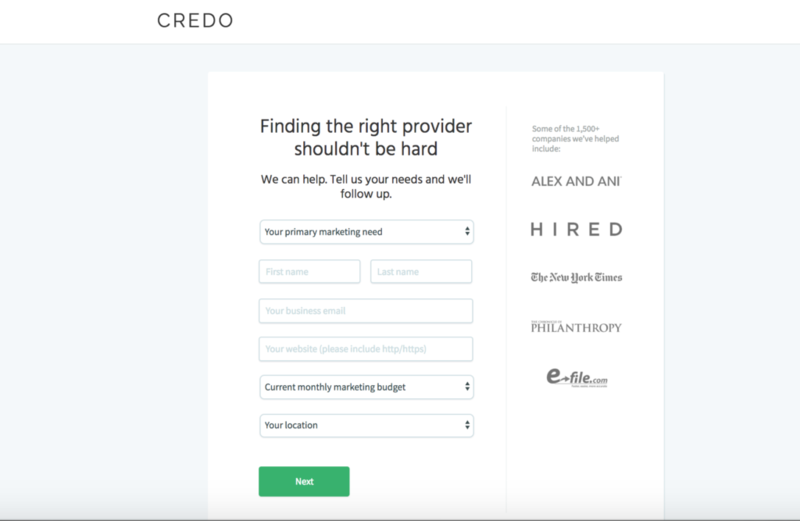 Over on Credo I’ve written about as many, and I’ve probably written over 100 guest posts as well, alongside a few large guides on Credo as well. As I add it all up, I can work out that I’ve written over half a million words on the internet in the last 8 years. I’ve published over a thousand Instagram photos, 80k+ tweets, done countless podcast interviews, and done my share of videos as well. I’ve done it all to provide as much value as I can to the community, to teach, to learn, to grow. I didn’t do it with the intention of becoming a “thought leader” or charging clients a lot of money. I did it because it’s how I am wired and it’s the right thing to do. But by having all that experience and visibility, I can draw on it to build trust. This one is the kicker. So many freelancers seem to think that their worth is static and therefore so is their pricing. Nothing could be further from the truth. If you are working for someone else, your skills are improving and you’re likely getting promotions and compensation adjustments. Why should those go away when you work for yourself? Why not give yourself a promotion (eg a pay increase) when your skills adapt and grow? If you’ve been self employed for any amount of time, then you probably also know that you improve much faster working for yourself than you do as an employee. But many freelancers think that their pricing is static because they have clients paying them a certain amount. They just charge the same price to new clients and then wonder why revenue isn’t increasing and they are stuck working with bad clients. Pricing is not static. Your new prospects don’t know what you are charging your existing clients, not will they likely ask. What do I need to make, then what do I want to make, and then add 20%. Before we get into that mindset, let me note that I have come to this rubric from many years of consulting and working with freelance clients. I’ve had my share of bad clients because I just needed to pay the bills. And now this rubric comes from a place of privilege where I’ve built my company so that I don’t have to take on new clients. I can when I want to. Ok, with that out of the way let’s talk about the rubric. First, what do you need to make? We all have fixed costs to life and they vary from person to person. If you work out that you only have about 25 hours per week of billable time productivity, then what do you need to charge for each of those hours to hit your base income needs? Start there and never go below it. Never. Second, what do you want to make? Once again, if you’ve been around the freelance world for a while then you know that some projects are incredibly value to a company and others are less so. Based off how personally excited or not you are about the gig, and how valuable it will be to them, how much do you want to make from that project? You have to be ok here with the client valuing it differently than you and thus saying no or negotiating back, but I think all professional services providers should ask what will make the project worthwhile to us personally. And third, add 20%. This is one where I often get pushback, so let’s dig into it. I add 20% because I want to know where my upper limit pricing is. I’ve received a lot of comments saying “but then you’ll price yourself out of some deals!” They’re absolutely right, but I’d much rather know my ceiling than wonder if there is one. And why 20%? Well, 20% is a decent chunk when you’re talking about potentially thousands or more dollars. If you’re thinking to charge $5,000 for a project, then this will push you to quote $6,000. It will be scary, but it will also stretch you and make you better at sales. There are two great things that come from this. Second, if the client negotiators back and you follow my advice of negotiating on scope and not price (eg, if they want a lower price then they get fewer services), then you can remove some services to lower their price but also your engagement size if you think they’ll still get good value from the new scope. And by doing this, you’ve still set a new base pricing! So how do you raise your freelance prices? First, make sure that you are truly a master of your craft and deserve the price you are asking for, because you can provide that value. Second, be visible and known as a trusted place to go so that your network (who is your net worth) refers people your way. Third, deliver value always. Give give give, because it comes back. And finally, remember that your prospects don’t know what you charge your current clients and that pricing therefore is not static. Slowly raise it so that you can discover your price ceiling, if you ever get there.